Jackson has been with us for over 2 weeks now. Her training is coming along, but we feel that some formal obedience training is in order to help her socialize around other dogs, as well as teach us a few things about how to handle the training of an older pup. So off we went to PetSmart to see what the current schedule looked like. While I was trying to figure out which class we wanted, one of their "trainers" approached me, asking me if I needed assistance. It turns out he is a retired Marine K-9 handler, who works at PetSmart part-time. He spent over an hour talking to the Smart Man and me about Jax, training techniques, how to correct specific behaviors, and more. The first thing we discussed was Jackson's breed. We had some suspicions about her mix, since she's far too small to be a Boxer/Akita (currently about 35-40 lbs at 8 months). The Marine took one look at her picture and said "She's a Basenji mix, no doubt." 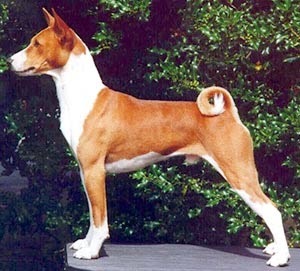 Once we saw a picture of a Basenji, it became glaringly obvious that he was correct. We now suspect the black around her muzzle, the not-quite-floppy ears, her big mouth, and her larger size comes from a handsome traveling man of Shepherd-like origin, but the rest is pure Basenji. The good news is now that we know her breed, our training strategies can be adjusted and we'll be more successful. Boxers are members of the Working Group category, and Basenjis are members of the Hound Group category. They're sight hounds, which means she should never be allowed off-leash. The bad news is they're also categorized as a primitive or ancient breed, which means she'll be much harder to train than the Boogie Dog was, due to temperament and age. Live and learn, and let the training begin. I've never heard of the "primitive or ancient" breed categorization. Where might one read more about that? Very cool, by the way. Hm, maybe. I never thought her face structure looked that much like Trygvi's, but crossbreeds can get all kinds of mixtures. As for the primitive breed thing, Grendel the wolfie was a whole lot easier to train than Trygvi, so I'm kind of skeptical. Not that Tryg isn't trainable, the strategies and the work required are entirely different. I think Jax would be a whole lot easier if we'd gotten her when she was younger, before all these crappy habit set in. We've changed the strategy with her (as compared to Boogs). Necessary for a sight hound with high prey drive rather than a working dog. I once fostered an extremely energetic 1 year old dog who hadn't been socialized. This meant she had no interest in my thoughts on things at all. She also had no interest in treats (she would actually take it, if offered, then drop it on the ground). Because she couldn't be controlled, it was tough to exercise her enough, especially with my small yard. Exhaustion broke me down (she was up ALL night), but what really made me hand her over to another foster home was the loneliness. I am not used to not connecting at all with animals and to face trying to connect with her on my own was daunting. The foster guy who took her had a large farm, several other dogs, and lots more experience with fostering. A couple weeks later, I adopted my cats. Strangely, Anne, you're describing much of my parent's showed-up-at-the-door dog, Harry Houdini. He'd most likely been dumped at the end of the school year by a student who'd gotten him as a puppy and then didn't want him any more. But he was so *nice* and sweet tempered we didn't much mind his complete lack of obedience. And by sweet, I mean that when my dad had ducks, the ducks would come swim in his water bowl and nose around in his food bowl, and he'd just ignore them. He was never ever aggressive towards another human or animal, which, where we lived, counted for a whole lot more than obedience.